When Google Photos first came out, I knew I wanted to become expert in it. I specialize in helping people manage their digital photos. I had been using, and teaching, Picasa (Google’s free photo management software) for over 10 years – and I loved it. Hundreds, maybe thousands, of other people were using Picasa and loving it because I taught them. But, the writing was on the wall that change was inevitable. Picasa was built for the world of digital cameras and computers – it only used the web occasionally, just for sharing your best photos. The world of photos was migrating to smartphones and web, no computer necessary. There are plenty of people today who take lots of photos with their phones and don’t even have a computer! Google understands this trend more than anyone. Google doesn’t just see the future, they invent it! So when they announced Google Photos as a brand new product, re-engineered from scratch, to handle all of today's digital photo needs – I wanted in! I immediately started using it in May 2015. Then I jumped in on the user help forums. I wanted to become expert in this product because I knew it was going to be good. I started reading everything I could find, and then answering people’s questions in the forum. It didn’t take long before the Google community manager for Photos noticed and invited me to join the Top Contributors program. Here is a 2 minute clip from our Button Show Episode 95 where we discuss how to get help on Google products. In this clip, I tell why I became a Top Contributor. This is a volunteer program. People become Top Contributors because they have a passion for the product, and a passion for helping people learn. Google then gives us perks. The primary perk is recognition of our expert status. The next is open lines of communication to Google and our other product experts. I am on a team that includes people from the Philippines, Germany, Ghana, UK, and of course Mountain View, California – Google Headquarters. 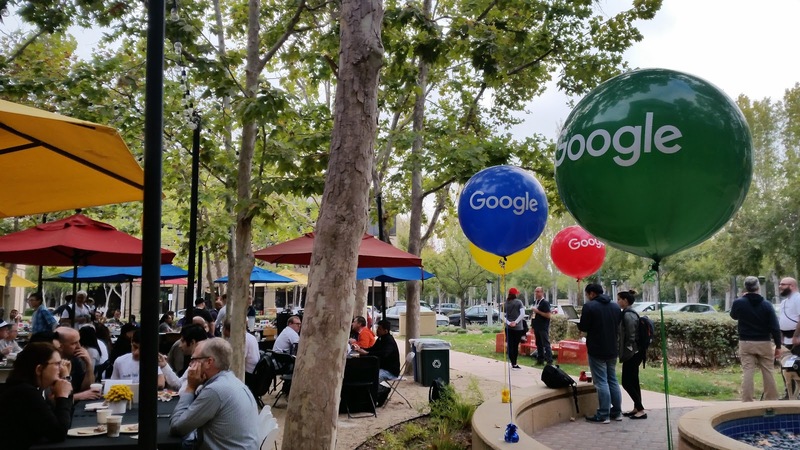 Every year Google recognizes it’s Top Contributors for all products and gives us the biggest perk – a trip to Google Headquarters in Mountain View, CA for a meetup. So this is what we were doing in California. Google paid for my flight and 2 nights in a hotel. Jim and I decided to make a week of it, sandwiching the meetup between teaching at a computer club north of San Francisco, and visiting friends south of San Francisco. The main event, for me anyway, was the meetup. The first night was a reception right in the hotel, so Jim got to attend this part, and he’s glad he did! The first person to come up saying, “I know you!” was referring to Jim! It was Michael Daniels who, with Jim, was very active in the Google Hangouts help with Ronnie Bincer. The only person there that I had ever met in person before was Brenna. She was our host on our first Google visit in 2009, now she is apparently in charge of this whole program. It was great to see her again. 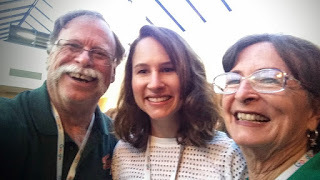 The main event began the next day and I was thrilled to meet the community manager for the Google Photos Top Contributors, Ben. He's kind of our "handler," acting as liaison between us and the product development team. He communicates with us at least weekly ,and sets up a monthly video call with all of us. Google Photos wasn't the only product represented - there were Top Contributors for Google Hangouts, Google Voice, Google Blogger, Gmail, Calendar, Android, Nexus, Search, Maps, Youtube, and many more! We heard presentations from several "Googlers" - that's what you're called if you work for Google! And, I got to get definitive answers on some Blogger questions and Google Voice questions I had - yes, I am a geek! They also facilitated several icebreaker activities, and of course meals. I think my favorite part was sitting with Googlers on the product development team for Google Photos - I had some questions of them, but they had even more questions for me! It was also wonderful to get to meet many of my team face-to-face. I not only have team members now, but also some new friends!